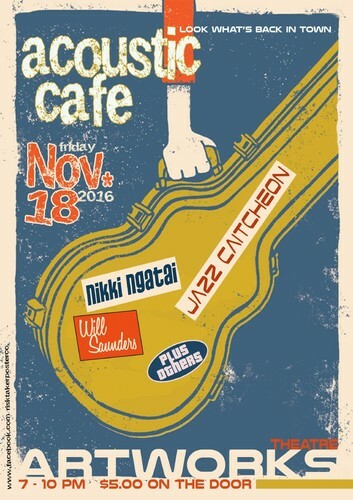 Acoustic Cafe is back, due to popular demand. An evening (produced by Ian Simpson) where you can hear original songwriters entertain you in the casual, friendly and warm environment that is the Artworks Theatre foyer. Bar & cafe opens at 7pm. - Will Saunders (from Auckland) is a true troubadour and an energetic performer Will has a huge depth of creative experience, has released numerous recordings, and plays regularly. - Nikki Ngatai is a much-loved local artist who also performs with local band Oyawa and whose songs are testament to her ever-developing craft as a songwriter. - Jaz Caitcheon has been playing for several years and, even at his young age, is already showing his maturity and ambition as a performer. - Others performers are being confirmed, so expect variety.